Happy Hump Day! I finally had the chance today to try to get you some quality pics of a room I just completed. I'm talking about Amanda's room that is finally complete hopefully for the last time, I swear it! I recently posted a mood board that I created for this room with the inspiration that came from a head board I purchased from Joss and Main. If you missed it you can read about all the crazy that is me here. Well, the room turned out better than I had even hoped. 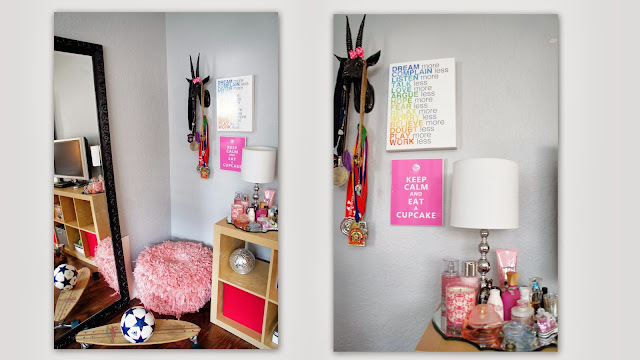 Take a look again at the before and the new after pictures of Amanda's room. 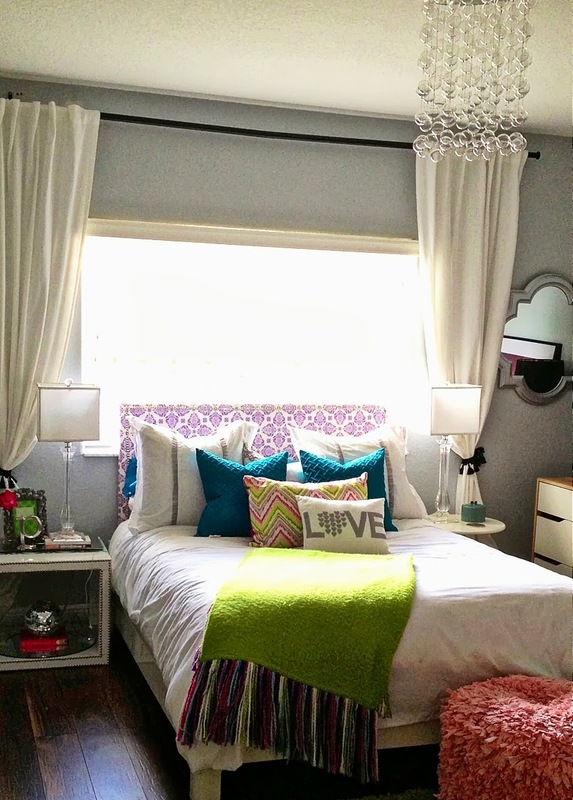 It's amazing and completely unplanned how the silver quatrefoil mirrors that I recycled go with the graphic design on the bed spread that I happened to find in a Home Goods store. I love it when that happens! Above is the view from the bed. I used the good old Ikea Expedit unit for her room. I know I've said it a million times, but this sucker is so wonderful for storing "stuff", and ALL kids come with "stuff". I say if you can't beat em, join em. Put it out there, in pretty boxes and on shelves. If you give kids a place to keep their things it makes life so much more organized and therefor makes the room so much nicer and clutter free. Above is a close up of that corner. I staged the expedit with a pretty vanity mirror to display her perfume, candles and nail polish on which I think is a pretty touch for any girl regardless of if they are big or small. Notice the black deer head with the little pink bow on it? Well that is the lone survivor of all the fake animal heads from our HGTV makeover. I can guarantee he's sticking around our house for years to come. I use it to hang all of her soccer medals. Cute and functional. Above is a close up of her dresser, I re-framed her art, cleaned up the accessories and added some silver and mirrored accents to glam up the natural wood of the dresser. The above picture shows a close up of the many textures, colors and prints that I used. I love that there is so much visual interest, but with the muted color on the walls and the anchor of white from the bed it all just works without competing and being too busy. I have one word for you, ruuuuuuuuugggg! Isn't it just amazing? I actually fell in love with this rug when I put it in another little girl's room for a client. It's quite the rug, no? Well I admit that it was a bit of a risk in the sense that I've got a whole lot going on in this room with all the prints, but when I put it in the original mood board I knew it would just work, and work it did. It's the right size at 8' round, and adds just the right amount of zebra, and with the rather large print it isn't as busy as one would think. Above you can see the lovely Besta Burs desk from Ikea that I posted about here. I still love it, and it's still going strong. It was such a great purchase and if you've thought about getting your own, do! On the desk I have a pretty silver tray with a lamp, and above it are 3 different colored cork boards which I scored on clearance for $5 bucks each! Baaam. And that chair, remember when I posted about it here? Well I found it a new home in this room, and I love how it dresses things up a bit and again adds an unexpected touch. I hope my poor photography skills didn't kill this room because it's even more stunning in person believe me. For now I LOVE it, and think it was about time to give Amanda a truly finished designer space. She deserves it. No more hand me down hodge podge room going on here. It's now a modern, clean sophisticated space that still screams fun for a teenager girl. I'm definitely done changing it around which is probably why I should have just done it right in the first place! What do you think? Are you digging the mixture of color and print or do you prefer something a bit more matchy? LOVE the bedding!! Does it have a name or brand on the duvet? Been searching the web for it but to no avail!! Hi Cynthia, thank you so much for your sweet comments on the room! The bedding was a score from Home Goods by no one that I knew of before. I wish I had the tags to possibly help you score one for yourself:( It was a while back. I'm sorry I can't be more help. Good luck in your search. in love with those curtains! wish I could find some to buy! I absolutely love what you did!!! Everything came together perfect!! 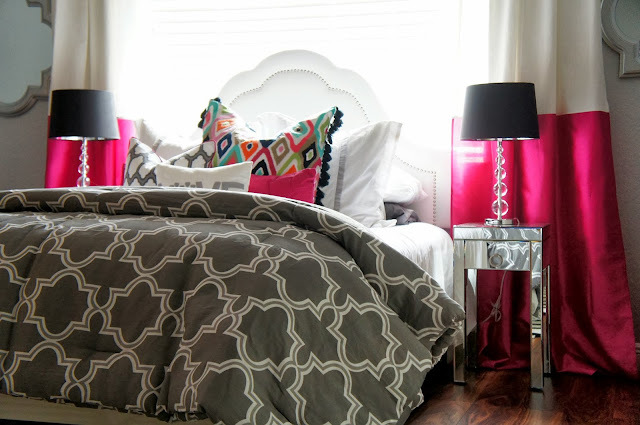 Where did you get those mirrored night stands and or how much? Hi Emily, you can buy the curtain panels in the linen at Ikea RITVA and then have one panel in what ever color you like added to the bottom. A dry cleaner should be able to do this for you for relatively inexpensive. 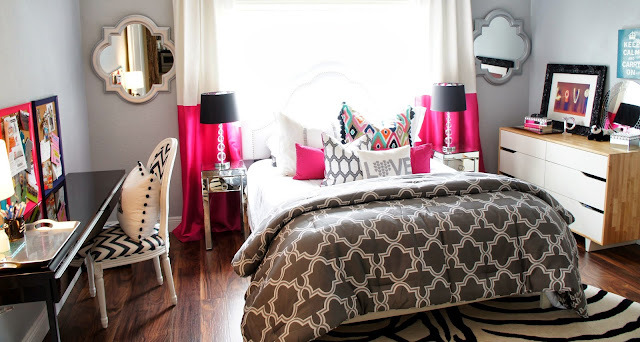 I'm totally in love with this room!! I'm hoping to do a slightly modified version of this for my daughter (her room is much smaller). I'm so excited to try this!! Is the fushia curtain that you used to band the white curtains the same brand as the white Ikea curtains you used, or another brand? I don't have an IKEA near me, but I'm able to find the white curtains, I'm just curious if I should try fabric from a fabric store to match my color, or if I should try another curtain for similar weight/feel... any suggestions? Also... do you ever do virtual/long distance make overs?? I'd love to do something similar to my bedroom!! Hi:) I was wondering where you bought the diamond print pillow because I cannot find it anywhere? Hi! I am absolutely in love with this room! Where did you buy the mirrors? Pillows? Rug? Sheets? Thanks!! Hi I was wondering where the diamond pillow was from!!! thank you!! 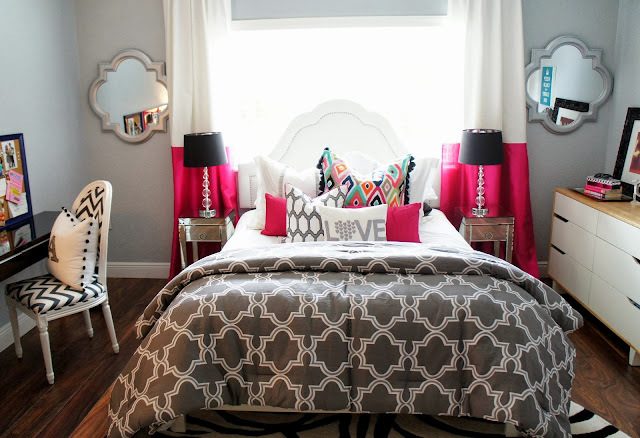 This room is so cute and helped me decide what I wanna do for mine. 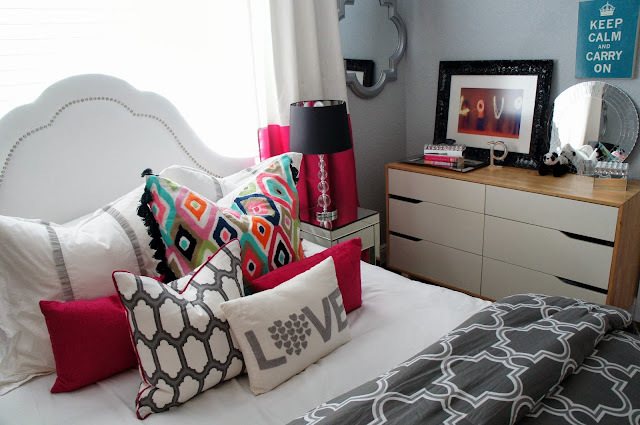 I really want the comforter and would love to know which paint that is. Like the name of it?